All pages on this site can now be accessed via our Site Map above. Just Click on Title or Thumbnail shown in Banner. much loved plants and animals. But, Common Terns, which weren’t a feature of Lough Allen 10 years ago are now expanding their numbers and are successfully breeding here. One shouldn’t attribute human attitudes to wild birds... but it is almost as if these two young Common Terns are excitedly thinking of leaving school and heading off into the big bad world! And why the colour differences? One red and the other orange. They look like siblings, about the same age; perhaps one is male and the other female! 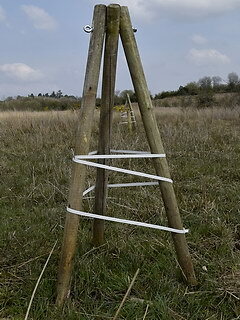 We have seen some strange birds here during the period we have been running LoughAllenBasin.com. Perhaps the most surprising was an Arctic Skua tiredly resting in the middle of the Lake on a calm warm late Summer’s evening some years ago. But they are not going to breed here... they are sea birds! 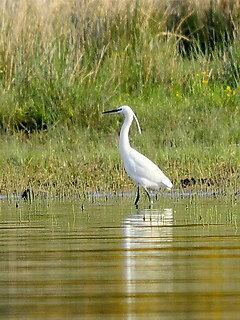 Also a few years ago a pair of Little Egret were seen one day frolicking in lush flooded shore at Yellow River. They could well breed here; they have been expanding in Ireland and Lough Allen has plenty of suitable shoreline trees — but we never saw them again, alas! Very regretfully, the intensive work of LoughAllenBasin.com has to be curtailed. It has been nearly 10 years of effort... all very interesting and a lot very rewarding. Lough Allen would greatly benefit from a permanent place for Wildlife. Many of our special species could be encouraged and expanded if there were more secure safe nesting or growing places for them free from predators or grazing animals. A Nature Reserve for Spiranthes is badly needed in the British Isles. Why not in Leitrim? Now seems opportune as this very exotic species is threatened by both Climate Change and increasing pressure on limited shoreline resources. Within this site you will find a unique record of Lough Allen and its surrounding hills over the past decade. This was a decade when regular foam pollution became present on our shores and also a period when there has been a remarkable decline in two cherished species... the Lapwing and the Curlew. 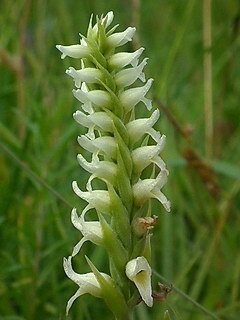 Irish Lady’s Tresses (rare Orchid) are still with us. As are the Red-breasted Mergansers and Sandpipers with much more recognition and appreciation than in the past. Our special orchid has proved very resourceful; where one site disappears another is found! The Mergansers less so, frequently failing to breed in cold Summers. Our work may be reducing but LAB is committed to monitoring the 3 species shown below in 2016. This is to ensure continuity of data and to monitor population change. These are three significant species. The two orchids are Flora Protection Order protected species and valuable for any farmer applying for grants under the GLAS scheme. The Bat, simply because we have been counting its numbers longer than any other species on Lough Allen and because we have promised Bat Conservation Ireland! Now flowering. Survey will continue from mid July to end of August. In the last two days (17/18 July) 15 budding or flowering plants have been recorded at 4 sites on the east shore of Lough Allen. Surveying for this species was completed last month. This is a widely dispersed plant and it is hard to completely survey a large patch of ground. They are also not confined to a very limited area like the Bats or the Spiranthes. The specimens we survey are on the northern flanks of The Playbank and, depending on weather may be on either fallen stone walls or in open fields. To standardise recording we cover a set distance of these walls and adjoining fields each year. This year the numbers were good (75) with more specimens than usual occurring in open ground. This is an increase of c. 20% on last year. One of the first to flower this year, but it has been growing all Spring. Spiranthes has a slow growing habit but flowers emerge quickly. They are difficult to detect without a bud. Strong buds often come from a successful flowering specimen in the same location in the previous year. We have traced their life cycle over a 3 year study. A major location for Daubenton Bats, the stretch of The Shannon between Galley Bridge (R280) and The Sluices on Lough Allen has returned one of the greatest numbers of bats in annual surveys over the past 10 years. LAB hopes to continue these surveys as it is fascinating to see the ups and downs of this species over the years. We claim this as a Lough Allen Basin rarity as it occurs on a mountain slope north of The Playbank and south of the Shannon, 6.3km from Lough Allen as the Crow flies. Numbers were good this year in the reference site with specimens moving off the walls and back into the fields. It is threatened by the improvement of stony hillside fields which are its niche. Other sites in north Leitrim and north Roscommon have been recently discovered. 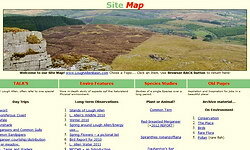 This site compares very well with others in terms of habitat and altitude. This species may be more common in the right places than we realise. It’s just the botanists that are getting scarce! 1. Irish Lady’s Tresses. This species will be emerging in July and should be visible until end of August. Typically it will be on wet shoreline, sandy or grassy or rocky, often facing south west — and probably now flooded! This plant can emerge underwater but if water levels don’t drop rapidly it will not survive this year. High Summer water levels have been a feature in recent years. 2. Daubenton’s Bat. This will be our 11th year surveying this species for Bat Conservation Ireland. We cover the stretch of the Shannon between The Sluices at Lough Allen and the next road bridge, Galley Bridge. Numbers vary but can be high. 3. Small White Orchid. Surveys for this have been completed (mainly June). Numbers were good in its known haunt in the mountains over Dowra. Also 2 other locations in Leitrim and Roscommon have been found. May be not as rare as thought? 2015 was a mixed year for Lough Allen’s biodiversity. Some of our rare plants and animals have declined. 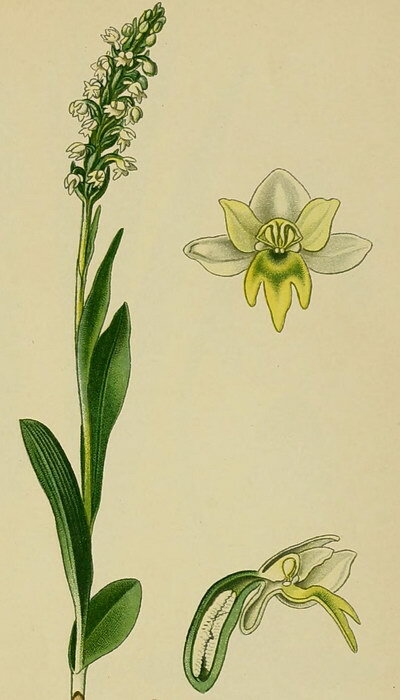 The orchid (S. romanzoffiana) increased its numbers, growing more strongly on sites where it had been absent in recent years and consolidating some continuously occupied sites but, also, being damaged or not appearing in other former haunts. Rising water levels are clearly a significant factor in this as, even if the flowers appear there is no chance to set seed with the seed capsule deep underwater as sometimes happens. Spiranthes romanzoffiana increased its numbers marginally with improving populations at Rossmore where it was much reduced last year, and at Mountallen where it is recovering after a 6 year absence. The changing distribution around Lough Allen over the past 8 years can be seen HERE. Other Orchids were abundant in later Summer with the Early Purple Orchid widespread around the lake in Spring. Small White Orchids near L. Allen were down in numbers and further restricted to field walls due to weather and land improvement. 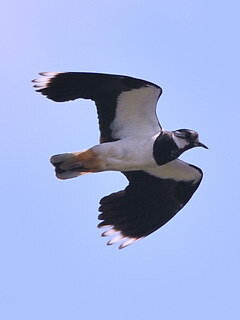 However, this species was seen in good numbers in parts of Leitrim where it was not known before. The Red-breasted Mergansers appeared in good numbers in the Spring but were then put on hold during a long spell of cold wet weather. They wait for warmer brighter days before nesting — presumably to guarantee a source of fish for their young. With this weather persisting into June they lost heart and left nesting areas with the males departing early and the females not much later. No young were seen! Lapwings and Curlews have also had a disastrous year and Common Sandpipers were also affected by poor weather. Lapwings hung around their haunts at Yellow River and The Spit for quite a while but by June when they should have been breeding they had disappeared. Neither Curlew or Lapwing bred in the area this year as far as we know, though a surprise sighting of a Redshank with a chick running across a road on the west side of L. Allen was made! Common Terns and Black-headed Gulls managed to breed, with the Terns expanding their numbers and sites. Common Gulls bred in scattered tree stumps above the floods but onshore nesting was a wash-out for these and the Lesser Black-backed Gulls. Finally, this year marks the 8th year of intensive monitoring and it is unfortunately time to reduce this activity. However, in conjunction with other people committed to preserving and enriching our heritage, we will be advancing some more conservation initiatives next year. Research on one of these commenced in 2014 and is reported HERE but implementation of conservation measures was difficult and patchy. We hope to do better in 2016! We have appreciated our voluntary decade on Lough Allen. It has kept us young and we have enjoyed the interest and the contribution of many people around the lake, especially those who work the land and notice the changes. However, we have now left the area but not travelled too far. It is impossible for us to maintain the heavy schedule of boat trips and exhaustive reporting... Unfortunately, this year, a combination of cold and wet weather (apart from a fortnight in May) has made it unattractive and unproductive to travel widely around Lough Allen. The Mergansers won’t breed in cold weather and Spiranthes romanzoffiana (the rare orchid) may be flooded before it even emerges! Very many thanks... to all who have shown great interest in the wildlife of Lough Allen and to those who have noticed or lamented the declining purity of the water due to increasing contaminants issuing from treatment plants. People using the lake or living beside it have suffered a loss that is deep and we too find it depressing to come across something wonderful and then be confronted with a problem, such as the Blue green algal blooms of recent years, which upset us and caused other people real loss. We only wish we could have done more, and pray that our optimism regarding a reduction in pollution in the years ahead may prove correct. The Mergansers, the vulnerable Lapwings, the Sandpipers, and the Pike and Pollan, the Small White Orchids, the Daubenton's Bats, other rare visiting birds, the Pine Marten and Otter, and the many other organisms we have described over the years, highlight the uniqueness of Lough Allen. Perhaps these pages will form a baseline study of what was here at this time. We sometimes regret that a Nature Reserve or a LIFE+ project could not have been established. Now new Agriculture schemes, like GLAS, promise a bright new future for Conservation and Agriculture hand in hand... but we do wish REPS would stop pulling down trees and leaving unsightly piles of waste wood and stones all around Lough Allen — especially during the breeding season for wildlife! In 2014, for the first time, we implemented conservation measures for Spiranthes romanzoffiana species in Lough Allen. These are continuing in 2016. LoughAllenBasin’s role to date has been to observe and record the biodiversity of the area at the start of the 21st Century. However this particular species, very special to Lough Allen, does seem to be under threat. Not all practical steps were achieved but we learned a lot from continuous observation of a Spiranthes Year-long Lifecycle Unfortunately weather is becoming more unsuitable in reent years year and few orchids emerged in unprotected areas. c) Negotiated with Dept. of Agriculture to ensure that such habitats (containing Flora Protection Order species) can be exempted from normal REPS requirements and would de facto give grounds for qualifying that Land on a biodiversity basis for the new GLAS scheme. Of the specimens protected in 2014 none of them flowered subsequently but we are able to follow their life history over a 3 years period. The original plan for this site (Derrintobber) was to fence off all of the area in which Spiranthes occured, again with the blessing of the landowner. (Thanks for all your help!) However this is a much more difficult and expensive an area to isolate totally but we are alert to the need to protect what was once a hugely important location for the conservation of this species. (ABOVE) A ‘BioTipi’ used in conservation of Spiranthes romanzoffiana. Lough Allen basin is a major geographical area in the North West of Ireland. 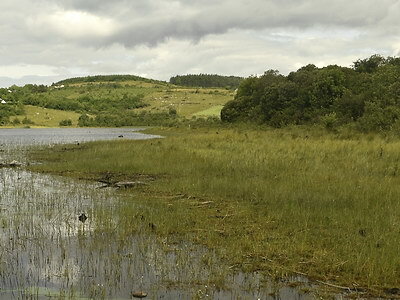 It is a medium sized Lake with the 3 towns of Drumshanbo, Drumkeeran, and Dowra at its 3 corners. The Basin embraces 3 counties but most of it lies in Co. Leitrim. Leitrim is Ireland’s smallest county, in terms of population, but quite elongated. With a population of only 28,000 there is loads of space to grow. Lough Allen neatly separates the county into a southern and a northern half. This site is dedicated to the aim of researching and conserving the unique environment of the area to meet the needs of the young educated people growing up in this region. Polluted water, rare plants, and people. BELOW is an area beloved of Spiranthes. It is a shallow muddy shore on the east side of an inlet near Rossmore. The rare Orchids grow all along this shore or, at least, they did. This year (2015) numbers (32) are well up on last years 6 but not the 50s or 100s(?) of previous years. This is unfortunate as this is an area that has been little disturbed and where all landowners agreed to keep cattle out during the flowering period. A Nature Reserve for the few acres involved might be the way forward? The area at the bottom of the picture has been prone to minor CyanoBlooms but these tend to be fleeting in this area. There is a small stream at the base of the picture and this may carry run off from nearby grazing land! More significant blooms regularly occur in another inlet called Druminalass. This one is much more intense and widespread and has occurred in exactly the same area as a worrying bloom in the same location in 2013. Another Inlet nearby with severe Bloom! Further details of the above incident can be seen HERE. Leaflet not available but PDF is: Click Image. The ABOVE link will bring you to some typical Lough Allen Plants and Animals. A major part of the Environment Background is Water and Geography. Water quality has been a growing concern for many years and many reports on this issue have been prepared. In mid 2015 there are still many concerns but no remedial progress as yet! Biodiversity is recorded in LOG2015 and previous yearly Logs are linked at the top of this Page! A WaterLOG. 2012/2013 recorded incidents of pollution up to the end of 2013. That data is now incorporated in the main Logs for 2014 and 2015. Lough Allen’s water needs some work. We have done much Study and Research on practical water monitoring procedures, reported in... Water TOPICS. We outline Ideas and Aspirations regarding the social development and environmental conservation of the Lough Allen Basin. We have always felt that it was for the Community (and those of you looking in from elsewhere) to respond to these ideas. We show Images of nature and beauty and wild landscapes to inspire you, and to persuade you, to think of this as a good place for your Enterprise! The variety and diversity of Wildlife in Ireland is what motivates us... and the international visitors who come to view it! For other people it is language, music, sport. But for all Irish people the Land is sacred. It is part of our history and beliefs. When we look at old documents and censuses we see the rent that every smallholding then had to pay for homes now long abandoned. Preserving quality of life is so vital! Freedom of the Land, the Famine, Emigration, are part of our psyche. The evidence is all around us. We respect the country in our own particular way and hope that what we do will conserve both species and diversity. But it is people and community that matters most. To see this land ever used for exploitative purposes is anathema to us and we hope that our work can convince our ‘Leaders’ not to be too blinkered in their rush for financial sovereignty. Traditions, a lived-in countryside, and respect for the land are more important than a quick, aggressive, probably futile, search for mineral wealth. We will use our data and experience to oppose this, in our own scientific way, should it ever happen around Lough Allen. These blooms (CENTRE) will destroy Lough Allen! They are unsightly, they can be lethal to Dogs, people should not swim in them, and their persistent presence is a clear deterrent to people visiting the area. 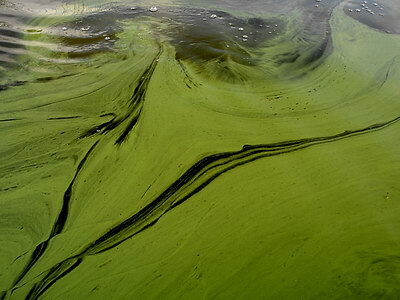 Virulent blooms such as shown above, are still scarce but the Cyanophyceae organisms contributing to these blooms are becoming established in quiet backwaters and as dispersed (non-bloom) cells in all parts of the Lake. The cause is not definite but may well be due to synthetic surfactants (with phosphate) probably associated with foam creating materials that are also becoming much more obvious all around the lake. We support the concept of full remediation costs (for faulty installations based on recent planning guidelines) being covered by the State. It’s simply natural justice. Please view the evidence we have for these claims and beliefs in the Index above. We have been in contact with the EPA in an effort to get Lough Allen’s changing water quality remedied. They have been supportive. We have recently sent a discussion document to them on our views, and views reported to us; also suggesting ways to get this fixed. Details of this discussion are also included in the Water TOPICS index. Why not think of establishing a European Base in a tranquil setting with easy access and available workforce. People have tended to leave this place. Now with first rate education and modern technology the Lough Allen area has become the ideal place for High Tech Employment. A new technical and scientific community in the area will benefit everyone and help protect our unique habitat. SITE MAP: EMPLOYMENT TOPICS List. The Lough Allen area has suffered much from emigration in recent years. It is a good place to live and work and suitable for various industry, Craft and Art enterprises. 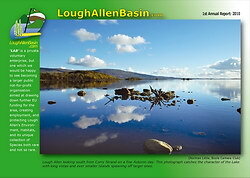 Lough Allens NATURAL Heritage... known around the World! Continuing to emerge at Lough Allen (2015) but decreasing and endangered. Not seen again since June, 2013. Perhaps their expansion through Ireland has been curtailed by cold Summers? 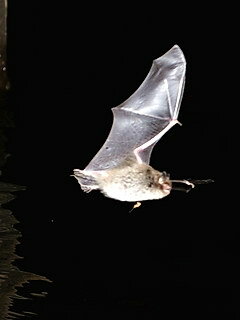 The Water Bat does very well in Lough Allen, this one snapped flying near The Sluices on the Shannon River. 2015 survey yielded good numbers.